Following my recent post about cold weather training, it’s a good time to praise the mighty odd object. Odd objects are an integral part of my outdoor training. Such objects come in all shapes and sizes. The common link between them is that they are heavy and awkward. A few examples include sandbags, water filled kegs, water balls, stones, and logs. The difficulty in carrying, lifting, or throwing these items is impossible to comprehend without hands on experience. Unfortunately, heavy odd objects receive little attention from the fitness industry. Such neglect should not come as a surprise however. Equipment manufacturers and gyms have no reason to promote heavy objects that are often freely available. Many fitness trainers also aren’t able to lift heavy odd objects so they conveniently overlook the potential. Perhaps the marketing gurus of the industry believe odd object neglect makes more sense than highlighting their inability to the masses. Fortunately, the rest of us can benefit from odd objects without worrying about what’s popular in the industry. I don’t need a stamp of approval from Planet Fitness to recognize and appreciate the potential. I have lifted heavy odd objects for many years and am still humbled by them regularly. Once again, it is impossible to verbally express how difficult it is to conquer these heavy, awkward, and unique objects. Even as you develop proficiency with one object (ex. sandbag), it doesn’t guarantee proficiency with another (ex. heavy log). Yes, there’s certainly some positive carryover, but to master a particular object, you need experience. There is no other way. Most recently, I have spent a lot of time lifting heavy logs. In years past, I’ve spent much more time with sandbags and stones. Log lifting and carrying has provided me with a unique challenge. I’ve acquired some logs that are just plain brutal to move. There is no other way to describe them. One day I may feel like a beast with a 600 pound deadlift, yet another day a log from the side of the road puts me back in my place. Words cannot express how difficult they are to lift and carry. To state that they are humbling is an understatement. What’s even better about the logs is that they were free. I literally acquired thousands of pounds of logs without paying a dollar. A power company cut the trees down and left them on the side of the road. They were available on a first come, first serve basis so I jumped at the opportunity to take them. 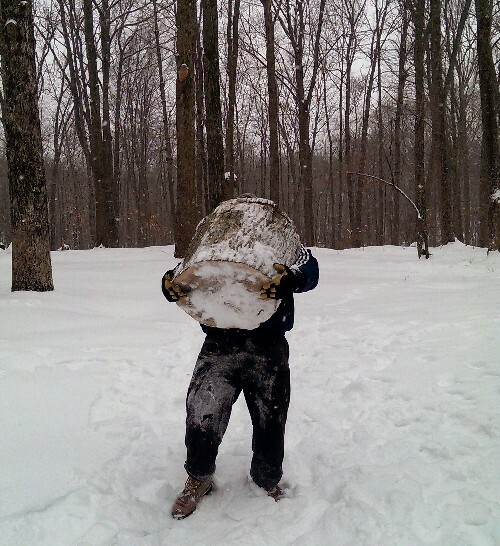 I now have tons of free weight which will next year become tons of free heat (burning in a wood stove). As for training options, I’m not suggesting that you disregard more conventional methods. I believe odd objects are best used as a supplement. It just happens that they are an extremely challenging and beneficial supplement. I use the logs as I do any other odd object. I don’t base my entire workout around the tool. The log instead serves as a valuable addition. For example, I may perform a few sets of heavy carries at the conclusion of a workout. 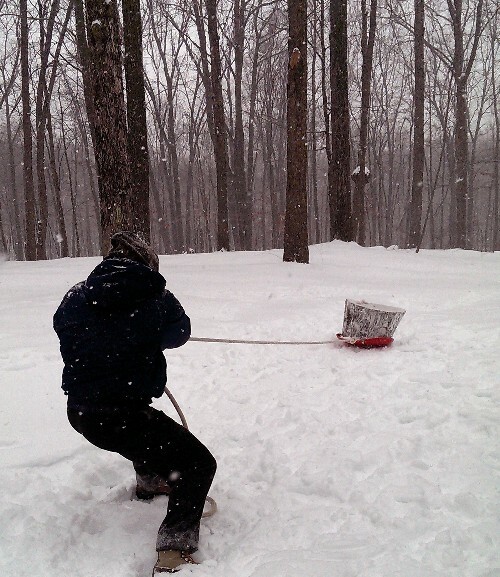 I also tend to mix in sled drags with the carries. I don’t need too much time with the logs to be challenged and benefit from their use. As stated within a previous entry, small additions here and there often accumulate into something much more significant. In summary, odd objects are not only challenging and effective, they are often the least expensive weight that can be acquired. Small additions with such tools can prove extremely valuable. Lifting odd objects requires a unique type of strength that cannot be developed adequately any other way. The next time you come across a large stone or log, don’t be so quick to ignore it. One man’s junk is another man’s treasure. Odd objects have become what I am known for I wish someone cut some trees near me. We don’t have them in nyc like they do in CT. These are really some great strength and muscle building tools.I don’t have access to barbells and dumbells or space but I do have access to my sandbags and my bodyweight stuff. Our long ago ancestors are probably rolling over in their graves and enjoying a good laugh at our expense. They probably scratch their heads and wonder why we will pay money for a gym membership and then drive a car only a couple of miles or less to get to that same gym to workout. It is amazing at how many “objects,” “tools,” or “junk” that the “modern” fitness enthusiast incorporates into his or her workout. Wheel barrows, sledgehammers, logs, rocks, old tires, kegs, etc. Long ago when people had to chop and saw wood, haul water, work with livestock, ride horses, etc., they probably would’ve thought someone was “touched” if they exercised just for the sake of exercising. Someone completely new to exercising might want to have a few months of conventional weight training under their belt before tackling logs, rocks, etc. I was feeling good about my workout Monday night. Deadlifts and Hill Sprints. It was 17 degrees I was running up and down a hill while people were sled riding. It was great. Then I see your post regarding winter training. Damn now I have to step it up. Another unique thing about odd objects is that they differ depending on environment .In this part of the world with so much construction work and cement around . I use concrete pavement blocks for lifting mixed with sprints on the construction site . Very interesting indeed . This is one of the reason why I love my Slosh Pipes… they are just a utter pain to work with… and that is why they are good.